This is one of those books where I watched the film first and instead of being compelled to see the originator of such heart wrenching drama I was completely put off. You can’t judge a book by its film adaptation any more than you can from its cover, blurb or glowing amazon review. However, each source of unreliable information does indicate the prowess of the writing on some level. I did not enjoy or hate the film. I was moved by the story but anything remotely related to cancer seems to reduce me to a jibbering wreck. So, background out of the way, I’ll get to my point now. From the first blast of Anna’s perception of the world I knew this was a great work. The story encompasses six points of view, each with a strong voice and a unique story to tell. Kate’s condition has a profound affect on everyone who meets her and it is how their lives change accordingly rather than the disease itself that forms the heart of the narrative. 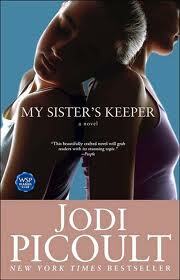 Picoult spins an intricate web of emotional suffering and strained relationships. The story flits between present and past without losing the pace or crowding the narrative. It is a cliche to say the book is better than the film but it is a cliche for a reason. My Sister’s Keeper reminded me of a book I picked up in a local charity shop about three years ago. Again it deals with a parent with a child suffering from an acute form of lukeamia. I would recommend Harvest of Heartache to anyone who was touched by the suffering of families in cancer-stricken times. The recommendation comes with a warning, the latter book had me in floods of tears compared to the sniffle of the former. Then again real life always seems more harrowing than Hollywood.